Ever since entering this contest for the first time two years ago, I have been eager to try it again. I had been hoping this would be the year, but midway through the summer, I realized there probably wasn't enough time left to paint an entry. However, I then found out that this year's contest would be held in Oregon, Ohio - only two hours away from me! That settled it. I had to enter! I decided to paint a blue-winged teal drake that I had photographed on a trip to Merritt Island in Florida. I worked day and night to finish it and managed to ship it off just in time. Then it was a long month and a half wait to see how it would fare! This year's contest took place September 27-28 at the Maumee Bay Park and Lodge, and my family was once again able to attend it! Being there in person is so nerve-wracking but still a great experience. The first day of judging consisted of round 1, where each painting needs at least 3 out of 5 IN votes to advance. Out of 201 entries, mine was one of only 12 entries to receive an IN vote from all 5 judges! That was a dream come true and a day I'll always remember. Unfortunately, the next day my painting fell a couple points short in round 2 and got cut before the final round. That was a little disheartening after the high of the previous day, but I still had a great time talking with other artists while we were there and seeing all the beautiful entries. The Federal Duck Stamp Contest is the most prestigious wildlife art competition in the country, so just to be in the running was such a thrill. My painting also received some very nice compliments from artists I truly admire, so that alone was a huge encouragement. It may not have been my year, but I left the contest feeling encouraged and more motivated than ever to keep trying! A highlight of my art career so far has been the opportunity to have original artwork at Mackinac's Little Gallery on Mackinac Island, Michigan. The gallery opened in May 2012, and I was so excited to be one of the first artists asked to send artwork to be displayed there. I had never been to Mackinac before, but I knew it would be a perfect fit for my art! I have since had drawings there for the 2012 and 2013 seasons. My drawing "Dressed to Impress" was a big hit at the gallery, and that inspired me to do more pieces of carriage horses. However, I needed reference photos first. So this summer, camera in hand, my family and I were finally able to take our first trip to Mackinac Island. We happened to be there on the busiest day of the season, but that just added to the excitement. The island is well-known for its carriage horses, and they were sure out in full force that day! (There are no cars on the island, so all transportation is by foot, bike, or horse-drawn carriage.) As I mentioned, my mission on this trip was to get photos to work from, so I spent a good part of our time there photographing the horses and scenery. This island is such a unique place, as well as a horse-lover's dream, so I'm glad we got to see it. And now that I have a lot of nice reference photos, I am looking forward to doing some Mackinac-related artwork for the gallery's 2014 season! This year I am taking on a bit of a different mission - the Federal Duck Stamp Contest! I first learned of this contest last year when a juror at an art show I was in strongly encouraged me to enter it. Although I was not at all familiar with painting ducks, I decided to check it out, and I was immediately hooked! I knew I wanted to enter, but first I needed some good reference photos to work from. So since last fall, I have been taking thousands of photos of ducks. After much consideration, I finally decided what type of scene I wanted to portray for my stamp, and now I am working hard on painting my entry. I know I will be up against alot of great competition, but I'm just excited to be entering it this year! I love that doing this has allowed me to look closely at a part of the animal kingdom that I may not have really appreciated before. Learning about ducks has been so much fun, and it has just reinforced how amazing ALL of creation is! The 2011 contest will be held at the National Conservation Training Center in West Virginia on October 28 and 29. My family is actually planning to travel there to watch all the entries be judged, so I'm looking forward to a fun experience! At the end of last year, I was invited to enter my second invitational show - "A Salute to the World Equestrian Games, 2010!" Once again, I did not have anything I could enter at the time, but I knew I wanted to do something that fit the equine competition theme. I began searching through my photos for some reference material I could use, and the result was "Eyes on the Prize," my pastel drawing of a show jumping horse and rider. "Eyes on the Prize" was accepted for the show and is now on display in Lexington, KY, along with the other beautiful artwork that was selected. This exhibition is being held at the Lexington History Museum from April 19 through November 1 and features work from a select group of fine artists from around the world. Being that this is the first time the WEG is being held in the U.S., this exhibit truly is a wonderful tribute to the 2010 World Equestrian Games, and I'm thrilled to be a part of it! This year, I was invited to enter a museum quality exhibition called "Pulling Their Weight - Draft and Carriage Horses in Fine Art." 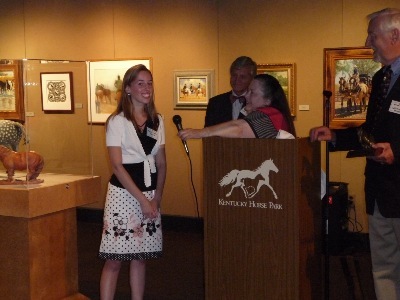 The show is presented by the American Academy of Equine Art and is being held at the Mackinac Public Library on Mackinac Island, MI, from July 1 through July 31, 2009. This exhibition is by invitation only, so I was very thrilled and honored to be one of the small number of fine artists selected for it. At the time I got the invitation, I didn't have anything I could enter that would fit the theme, so I did a drawing of Jake the Gypsy Horse 2 (which looks exactly like my first Jake the Gypsy Horse). Jake the Gypsy Horse 2 became one of 41 pieces accepted for the show, and it will be on display at Mackinac Island through the month of July. I was also notified recently that Jake sold on the very first day of the show! That was just icing on the cake, and I'm very excited to have been able to be a part of this exhibition. In 2008, two of my pieces were accepted into the American Academy of Equine Art's Fall Open Juried Exhibition at the Kentucky Horse Park! This was my first national art show, and it was such a wonderful experience. My charcoal drawing of Jake the Gypsy Horse received the Founder's Award for overall excellence, and my painting A Hundred and Ten Percent also went on to win the Popular Choice award. 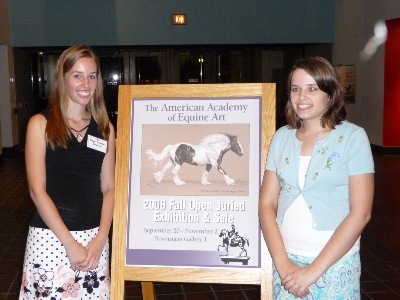 Jake the Gypsy Horse was also used in the advertising and promotion of the 2008 AAEA Fall Exhibition. Here I am standing next to one of the posters with my sister Amber! For more information about AAEA, visit their website at www.aaea.net.